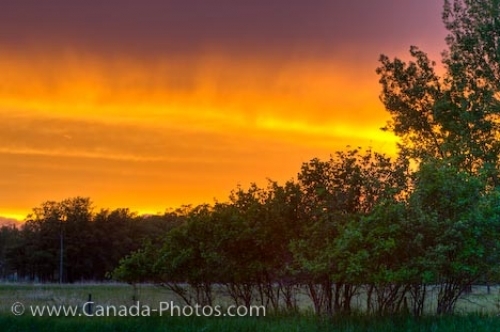 The sky is ablaze in fiery colors at sunset over the prairie landscape in the City of Winnipeg in Manitoba, Canada. Fiery colors highlight the sky over the City of Winnipeg in Manitoba, Canada at sunset but some dark clouds move in, bringing with them the possibility of a summer rain shower. The trees across the prairie landscape flourish in green hues during the summer months with the rest of the fields becoming drier and a rain storm is something most people are glad to see. Winnipeg City is the largest city in Manitoba, Canada where about 675,000 people can see a fiery sunset such as this fairly often during the summer. Various weather patterns sweep across the sky above the City of Winnipeg as the prairie landscape is limited to any mountains or hills. Mother nature is a miracle worker and when a fiery sunset highlights the sky over the City of Winnipeg, there are very few people who do not stop to enjoy the scenery. Picture of a sky of fiery colors above the City of Winnipeg, Manitoba during the sunset hours. Sunset and cloud formations over the City of Winnipeg, Manitoba, Canada.